Can flea farts change the temperature of the dog? The Earth is warming up. Globally. Not in Estonia :) It’s been quite cold here just days before the Midsummer’s Day. But on the average, the climate change has become significantly alarming especially since the mid-20th century. Scientists dispute whether the rising average temperature is unprecedented or within normal climatic variations. The big question is whether or not humankind has contributed significantly to it. Some argue that the human race is to take all the blame, others point out challenging facts e.g. the eruption of a single volcano can equal the entire amount of toxic gases produced and emitted into the atmosphere by mankind during several years. Yet another group of experts claim it’s just the matter of poor measurements of the past in comparison with today’s scientifically collected data. According to some conspiracy theories it might well be that the actual climb of the Earth’s average temperature is a delusion provoked by “green businessmen” to acquire revenue by creating a brand new market of green solutions promising to save the planet one day. The array of separate opinions is controversial. The 2009 United Nations Climate Change Conference, commonly known as the Copenhagen Summit, was held between 7 December and 18 December. The 2010 United Nations Climate Change Conference will be held in Cancún, Mexico, from 29 November to 10 December 2010. It will be the 16th session. The Kyoto protocol, which is the most prominent international agreement on climate change, is also highly controversial. Some argue that it goes too far, according to others, not nearly far enough in restricting emissions of greenhouse gases. China and India, the world’s two most populous countries, both ratified the protocol but are not required to reduce or even limit the growth of carbon emissions. It seems that the world just cannot come to an agreement. Global warming is occurring and is caused by human activity. Global warming is occurring but is primarily caused by natural processes rather than human activity. Global warming is occurring but its real cause is unknown, it is too early to ascribe any principal cause to the observed rising temperatures, man-made or natural. Global warming is occurring and it will have a devastating effect on the Earth’s environment. Global warming is occurring but it will have few negative consequences, the rising temperatures will be of little impact for human society or the Earth’s environment. Global warming is not occurring and the illusive “rise” of the average temperature is simply a matter of different measuring techniques used throughout the decades and centuries. So, how big is it, again? If you focus on the mass of the air, it might look like a whole lot. But it’s nothing compared to the entire mass of the planet itself. The same proportions apply to the size of the atmosphere. The Earth’s diameter is 12,700 km and most (3/4) of the air around it extends to just about 11 km from the surface. In other words, 75 % of the atmosphere is within a layer of just 11 kilometers thick. This is very little compared to the size of the planet. In your personal life, in order to better understand the critical situation you’re in, it sometimes helps if you can distance yourself from the problem and take a look at it from far away. You’d have a different perspective on things and be able to make your judgments considering all aspects. We need to see the big picture to get a better impression of how thin the layer of air around the Earth really is. 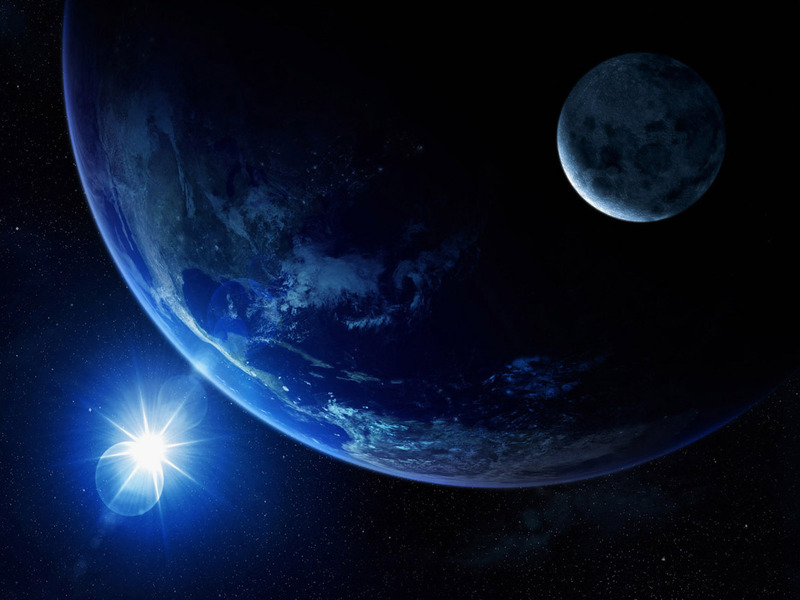 Should we be able to travel far away from Earth and observe it from a distance, we’d be seeing the picture of a blue planet surrounded by a very thin line, the atmosphere. For instance, if the Earth in this picture was 1 meter in diameter, the thickness of the atmosphere would be 0.78 mm. Yes, less than a millimeter. It’s skin deep! And the same way your skin protects you, the atmosphere protects the Earth. The Earth is often referred to as a living planet, and it is! It’s a balanced ecosystem, a swarm of life sustained and nourished by the one thing we all share. This complex system is shielded from the deadly radiation from outer space by this fragile protective layer. It’s the thing that makes life on Earth possible. If you were on a spaceship in the outer space, would you be considering to start messing with the life support systems just to kill time on a long journey? It wouldn’t be a very smart thing to do, would it? I guess eventually you’d be killing yourself and everyone on board. Well, our planet is our spacecraft and we are on a life long journey through space. With the shields down we wouldn’t stand a chance. All in all, we have seen that there is a multitude of scientific views on the issue. Which of the above mentioned approaches of the climate change do you think is most likely? Is global warming happening or not? Who is responsible? Is it going to have a serious impact or not? Considering that the atmosphere is in fact as thin and fragile as we have seen, does it really matter? We have to make sure that we, the only intelligent species there is, do everything we can to preserve and protect that which preserves and protects our very existence. There’s an old proverb that says just about whatever you want it to. One of them goes, “He who lies down with dogs rises with fleas.” How many fleas would you normally expect to be on a dog? A dozen? More less. Aren’t they considered parasites that the dog owners desperately try to get rid of? I wonder why that is. A couple of bites will do no harm! The fleas just feel hungry, so they feed on the dog a little and then go away. New fleas will come and go and so on and on. Can flea farts change the temperature of the dog? Probably not, at least not until the dog stays healthy and its immune system can cope with the harm done. It’s a balanced system. Now, imagine there’s a lonely dog out there with 6.8 billion fleas on it, all doing the best they can to dig in and process, consume and devour. And more fleas keep coming every second. Can flea farts change the temperature of the dog? Sure! Don’t you think the dog’s going to have a fever, globally, and then kick the bucket soon after. And as for those poor fleas, it would be game over. Global warming is a serious topic that only ignoring is NOT going to solve! Thanks for the clarifying blog post. Thanks for spreading the content. This blog is for sure bookmarked! If you need more knowledge on global warming, or the carbon tax, take a look at Carbonizm.com it really helped me understand it more.